The importance of having a clean, reliable database should never be underestimated. Yet the best-laid plans are often thwarted by a combination of human error and unoriginal naming conventions. Are those five entries for Mr. J. Smith in your contacts list five different individuals or the same one added by five different salespeople? Cleaning this up is massively time-consuming, which is why we’ve been working hard on prevention rather than cure. Pipedrive’s import system is fairly foolproof when it comes to creating duplicate records. Unfortunately, most duplicates are created manually, which is quite understandable when larger sales teams are involved. 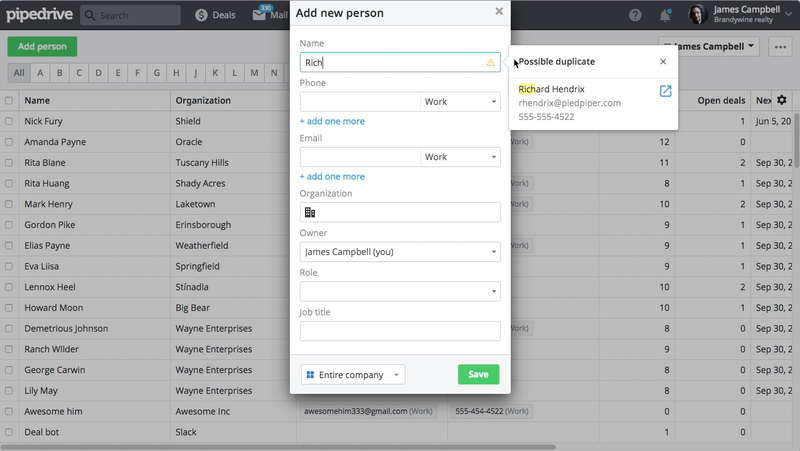 Most duplicate entries are created when users add a new deal or person in the organization detail view. Combine this with the passage of time and you may end up with several records for the same client with different email addresses or phone numbers. It is equally confusing and annoying. 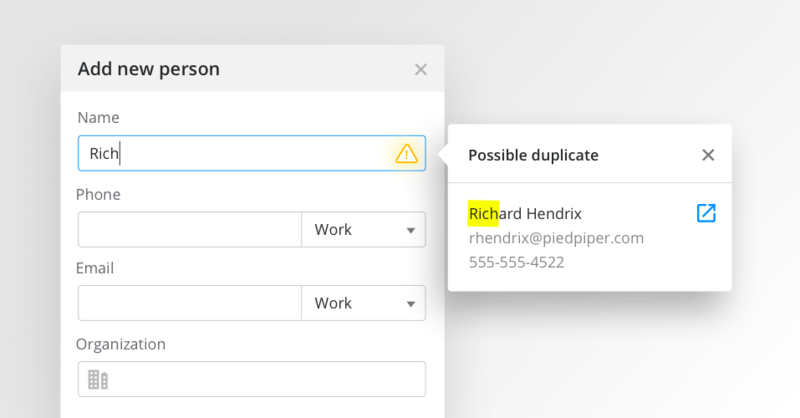 Our new duplicate prevention feature helps you guard against human error and keeps your database squeaky clean. A user opens the "Add Person" form and starts typing the customer name. Once they have typed three letters, a search query is run looking for matches in the existing database. If one or more is found, it is displayed to the right of the form. The user is then warned that the person they are about to add may be a duplicate. To the right of this warning is a blue icon. Clicking on this opens up the full detail view for the existing contact. This is important - you can choose to disregard the warning and add the new contact regardless. After all, you may really want to add a second or third John Smith. We will be rolling this feature out to all users in batches over the next few weeks, so keep an eye out for it. Similar systems for Deal and Organization entries will follow next.